Chrysalis School Montana: Chrysalis Academics: Above the State AND National Average! Chrysalis Academics: Above the State AND National Average! Kudos to the 2014 High School Graduates of Chrysalis! They are ready for college success. 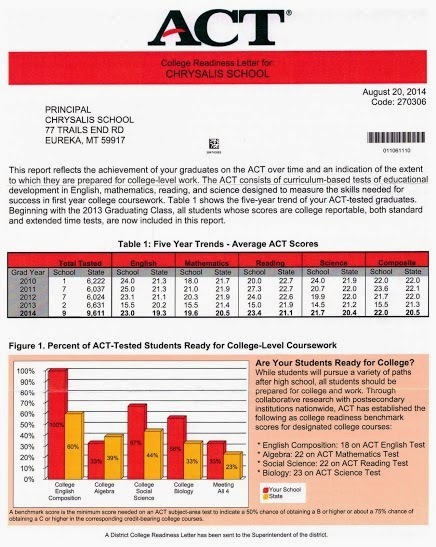 The ACT College Readiness letter has arrived in our school office. The results are shown on the graph below. 100% of our students who took the ACT met or exceeded the benchmark score of 18 on The ACT English Test. The average for Chrysalis students was a whopping 23...a full 5 points above the benchmark. Also shown on the graph, our students outscored the average Montana student who took the test by 40 percentage points. College Social Science scores as measured by the ACT Reading test also exceeded the benchmark. We couldn't be happier. Chrysalis students are out performing other Montana students in 3 of 4 areas measured, and even out score them with the number of students who reach all four benchmarks. Meeting a benchmark score means that a student from Chrysalis heading to her first year of college will be 50% more likely to get a B or higher in that college course. Chrysalis girls are succeeding academically, and we are happy to share the news with you. What a great time to be a Chrysalis student and have the privilege of experiencing its supportive and challenging academic environment. We are proud of what our girls have accomplished, and look eagerly forward to the new school year. Continued success stories are on the horizon as we strive to regularly make improvements in our academic program.